The Cinefilipino Film Festival makes its debut this year, screening eight new feature films in Gateway, Lucky Chinatown, Newport Cinemas, and over the weekend, the Shang Cineplex. This new festival arrives in a crowded festival scene. Let’s see what these guys have to offer. Sari and Kiri Dalena combine their formidable talents in the gripping docudrama The Guerilla is a Poet. The film is split between interviews with founding members of the NPA and dramatic reenactments of their life in the early days of the revolution. The film is notable for the intimacy with which it treats its subjects. It opens with Jose Maria Sison and his wife in the Netherlands, just about to head out for a small birthday get-together. The first few bits of interview has them interrupting each other, with slices of domestic life just happening in the background. The scenes dramatized in the film share this intimate, domestic quality. They don’t simply focus on the politics or the milestones of the movement. The film lingers in the smallest moments, in the friendships formed and the loves that blossomed. The camera’s extremely shallow focus draws the eye to the closeness of these characters, and imparts a deep sense of strange nostalgia. The docudrama is somewhat of an underutilized form. The Dalenas use it to great effect, bending artfulness with hard research in ways that are infinitely compelling. Mike Alcazaren's Puti concerns an art forger (Ian Veneracion) that gets into an auto accident, and awakens to find that he's gone colorblind. His young son has gone into a coma. As he waits for his son to get better, he tries in vain to get back to work. And that's when weird things start happening to him. He sees things that aren't quite there, and begins to lose his grip on reality. The film is pretty great when it allows itself to get fully weird, Alcazaren displaying a flair for odd visuals that simply can't be matched. But the film takes a painfully long time to get there, the glacially paced plot lacking any sort of driving action. It meanders through the main character's days without any urgency, just waiting to spring a final twist that delivers all of the story's lessons in one fell swoop. It's a gorgeous production all in all, but the story just doesn't quite come together. Ato Bautista waxes romantic in Mga Alaala ng Tag-Ulan. Sixteen-year-old Santi (Akihiro Blanco) falls in love with Marie Claire (Mocha Uson), an older woman who asks to share his umbrella on a fateful rainy day. There isn't really a whole lot more to it than that. It's a story of teenage infatuation played at a melancholy pitch, with overly dramatic narration sketching out a tragedy that isn't really there. The film sometimes plays it all off as a joke, as a sort of commentary on the heightened emotions of a young romance. But then it returns to the breathless melodrama of the narration, making a case for a teenage crush that hardly seems worth remembering. The first set of shorts is certainly diverse. Kathang-Isip plies horror aesthetics to tell a story of a young girl forced by circumstance to grow up. It’s a stylish, atmospheric little exercise. Princess Urduja draws parallels between the legend and a family's experience of tragedy. It’s not the most adventurous short, but it’s a sweet story. Ligaw uses the lo-fi imagery of Digital Harinezumi to tell two very different stories of courtship: one defined by its innocence, the other with the anarchy of young adulthood. The aesthetic adds a layer of visual melancholy to the proceedings, which in the end kind of feels like a PSA. Logaritmo immerses the audience in the banal existence of a directionless eighteen-year-old, making poetry out of her mundane surroundings. It could probably stand to be a little shorter, but it is the short in this set that has the strongest sense of perspective. And World Ipis is a claymation film that's largely made up of a cokroach delivering a rousing speech railing against what his unjust place in the world. The animation is a little rough, but it’s a pretty entertaining short anyway. 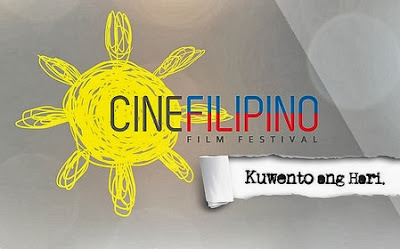 Cinefilipino Film Festival runs from September 18 to 24, 2013, at Megaworld Lifestyle Malls, Newport Cinemas, Resorts World Manila Lucky Chinatown Cinemas, Gateway Mall Cinemas, and Shang Cineplex. For screening schedules and information, visit http://cinefilipino.com and like their Facebook page (CineFilipino). The first CineFilipino Film Festival aims to seek out, support and develop new cinematic works of artistic merit by up-and-coming and established filmmakers that help define the human experience through a Filipino perspective.